Geez that title is a mouthful! But it’s a big title for a big project that I’m pretty pumped about sharing fuh reals. I’ve actually been thinking about doing this ever since I hung some DIY’d frames that I wasn’t sure about from minute one. I even mentioned how I felt in the end of my post about them. Just. Meh. 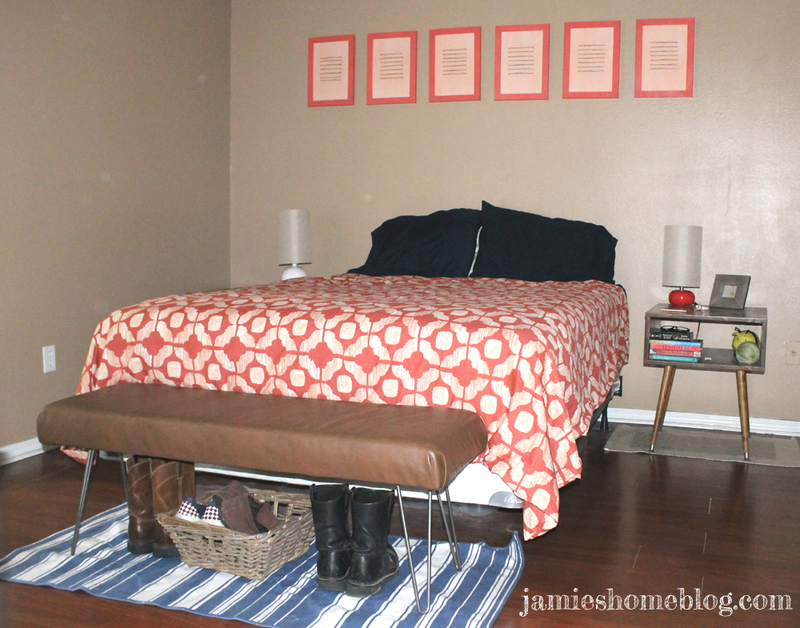 Ipso facto – an able bodied novice with a few bucks and smidge of determination can totally tackle this, and they too will be left with a really cool, unique and bold headboard! You ready? 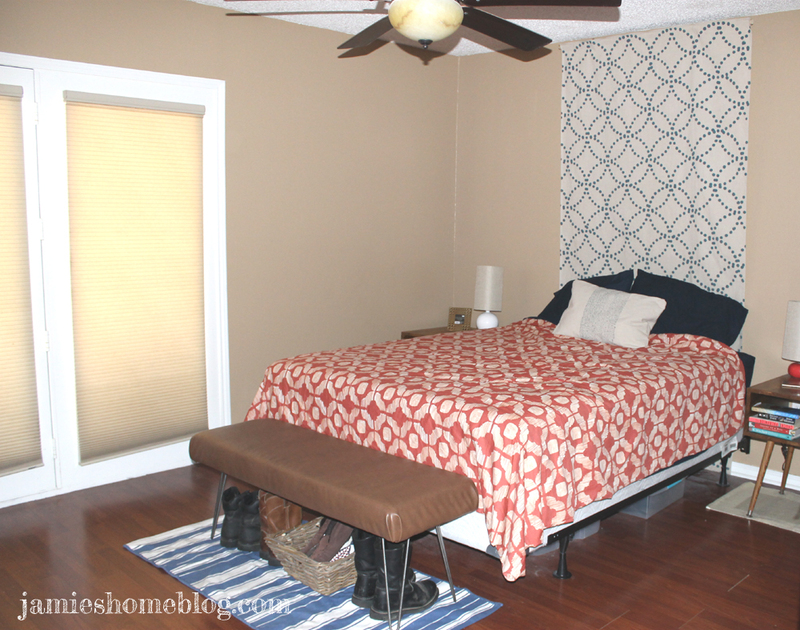 Click here to see how I made my curtain out of a $10 drop cloth! I already have a couple of patterns happening in the room so this took some careful thought. 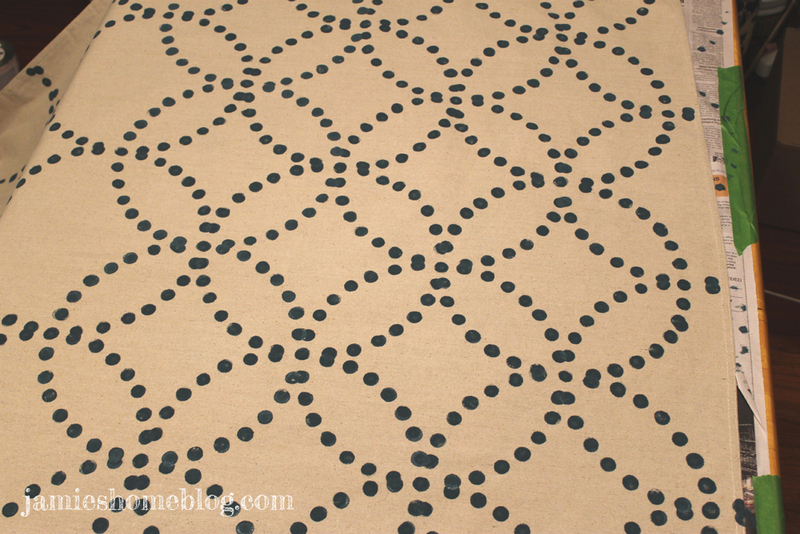 My duvet is this beaut from west elm and my rug is this little guy from IKEA. I read this post once about mixing patterns – I wish I could find it or remember where I saw it – but it gave great advice. It said to make sure your mixed patterns are three different sizes – small, medium and large. My duvet is my medium. The ikat design resembles Spanish tiles and each little chunk of the pattern is about 6″ wide. My striped rug would be my small. I guess because some of the irregular stripes are skinny? I don’t know, I never said I was an expert. Anyway, my textile headboard was to be my large pattern. Which is good because I kind of already had a design in mind, and it ended up fitting right in with the duvet. If you follow me on pinterest, you may have seen my recent Endless Circle pattern pins (here, here, here). 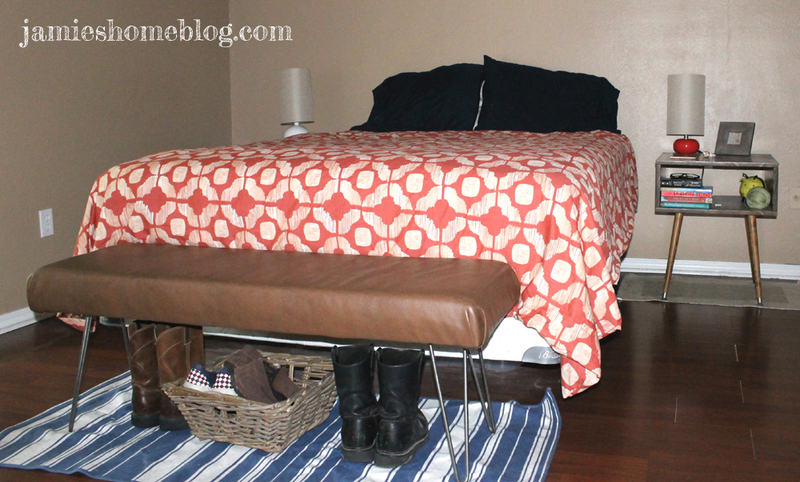 I was inspired by the pattern on the wood headboard in west elm’s picture of my duvet (check it out here). If you don’t care about how I made my pattern because you want to make your own, skip on ahead a few pictures / sentences. To recreate the endless circle look, but with dots instead of a solid line, I needed a template. 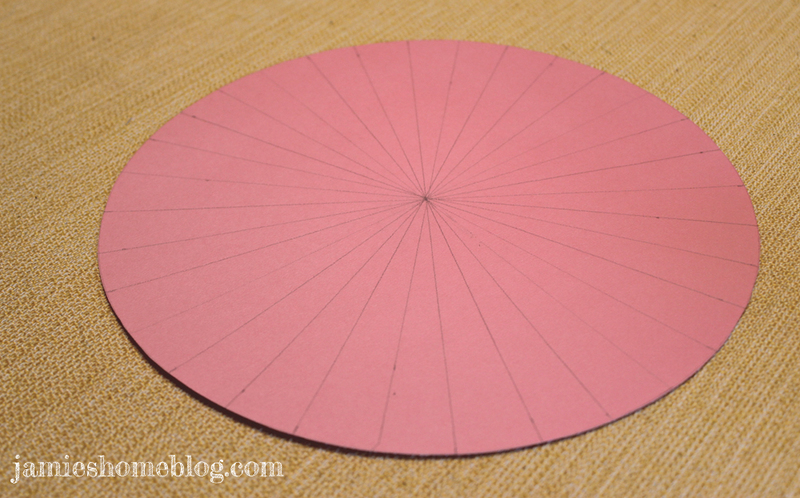 I used a math compass on card stock to create a 10″ diameter circle (referred to as a “pie” henceforth) and cut it out. Then I drew a line through the middle of it, and a line perpendicular to that. Then I sliced each of my four pie slices in half with two more lines. And then each of them in half again with four more. And then in half again with eight more lines. So I ended up with 32 slices of pie. Make sense? The plan was to put a dot next to the end of each line around my pie. I started with the center of my pie at the very top of my canvas in the middle of the width. 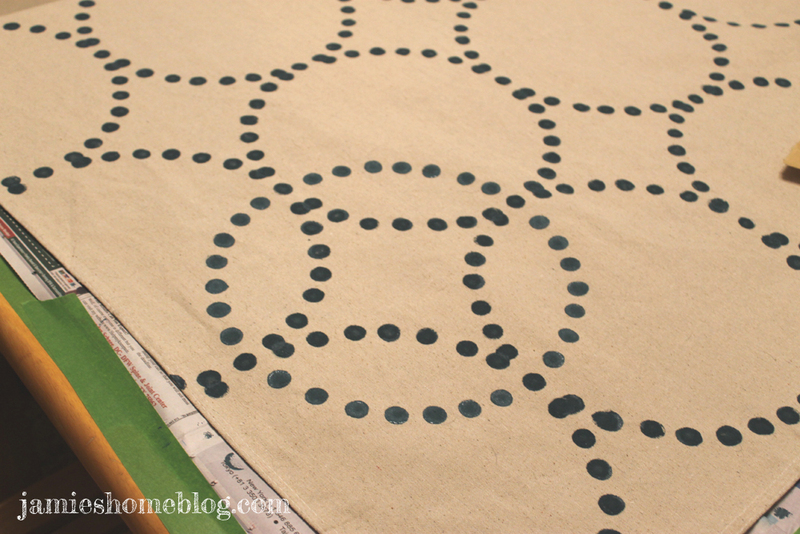 I used a craft sponge pouncer dipped in latex paint to make my dots. Here’s where the newspaper comes in. Friends, when I decided to paint on a drop cloth, I didn’t think I’d need to protect my work surface. Isn’t that what a drop cloth is designed to do?! 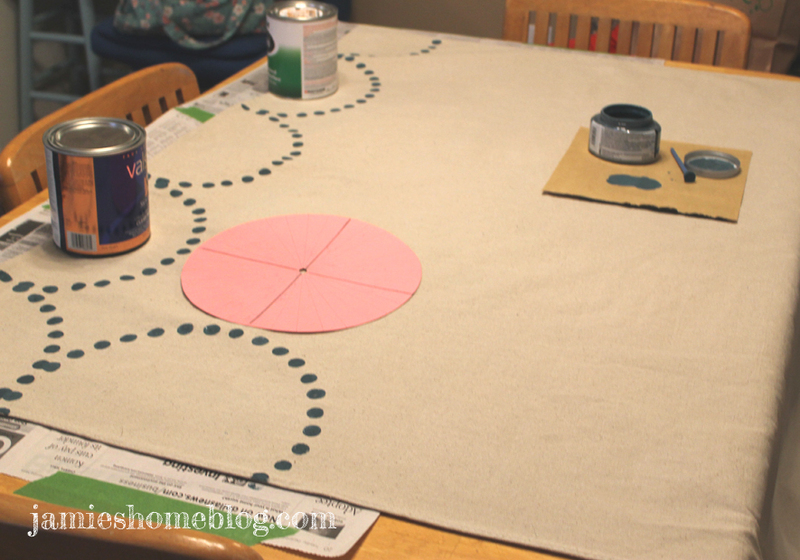 Well after my first row of circles I noticed that my paint was bleeding through onto the dining table! EEEP! It was at that point that I taped some newspaper down underneath the drop cloth, which did a dandy job of protecting my table from bleed through. 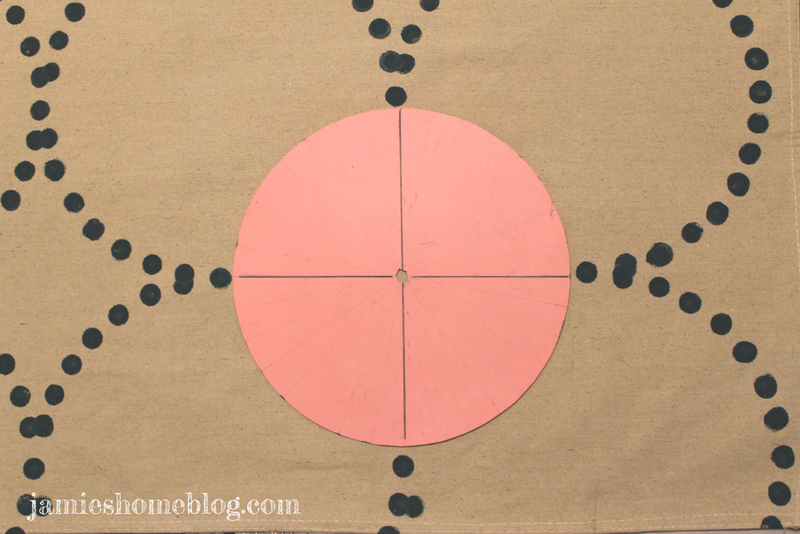 I then continued to paint my dotted circles using my template and following a right to left horizontal path. The paint is the same blue I used for my striped wall art (Valspar Perfect Storm). It kind of has greenish undertones but the canvas seems to neutralize that. 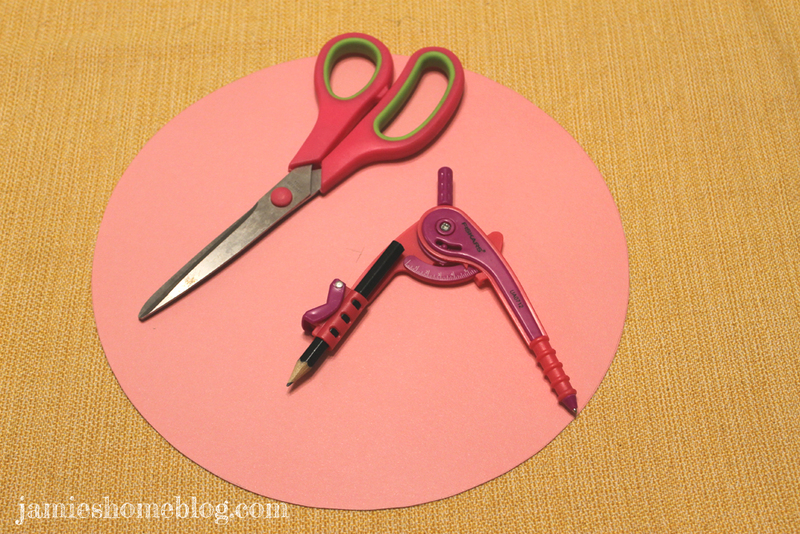 When I completed my circle pattern, I staggered the template to create a lattice look. I can’t think of a better way to describe this process so here are some fun visuals. Once my painted pattern was dry, It was time to hang this bad boy up! 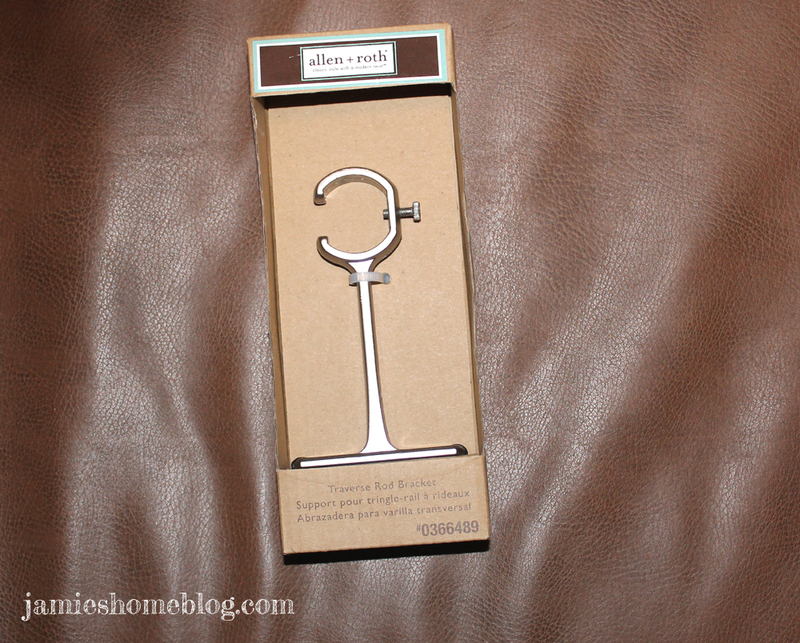 I used these traverse rod brackets from allen + roth. 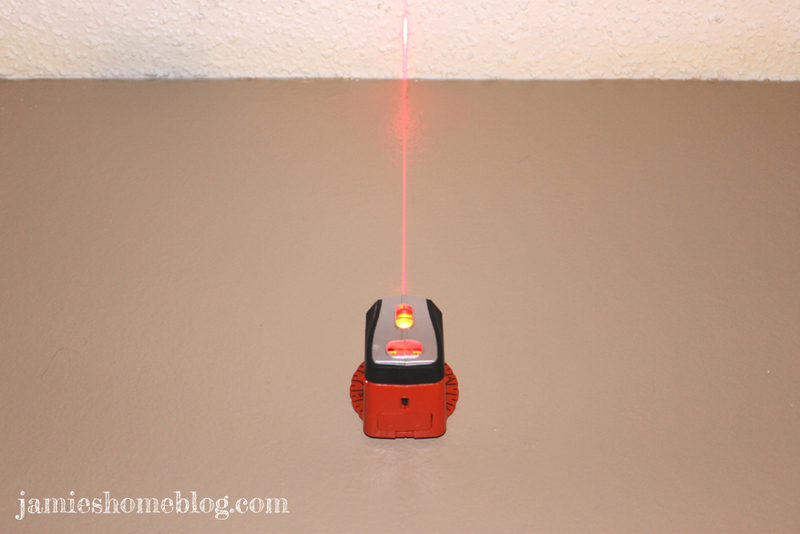 My handy laser level made it easy for me to be sure that my brackets were perfectly vertical. I marked where the screws would go, drilled pilot holes and put in the anchors for the screws. 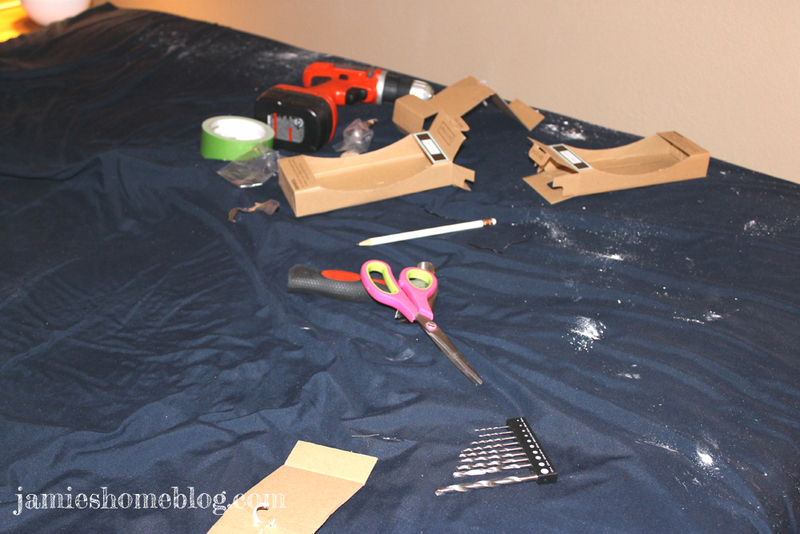 And because I like to keep it real, this is what our bed looked like after that part of the process (sorry, babe). Don’t worry I washed the sheets immediately after. Anyway all that was left to do was hang the canvas up and revel at my new headboard! Much better than the “before” if you ask me. 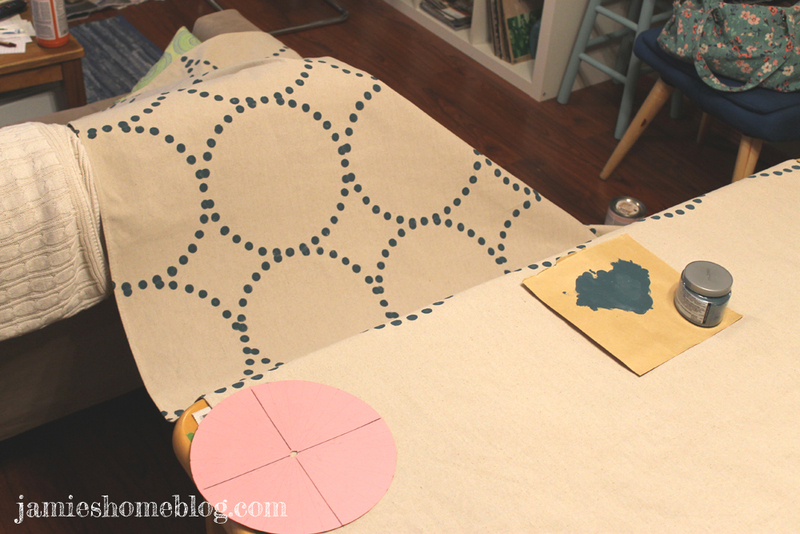 And I even had enough canvas fabric leftovers to make that toss pillow – I’ll be back with the quick how-to for that soon! I will say this massive textile kind of makes that wall to the left look bleak and empty, but because we’re moving soon, I don’t know if I want to spend a ton of time hanging things on the walls. I need that thought to marinate for a minute. 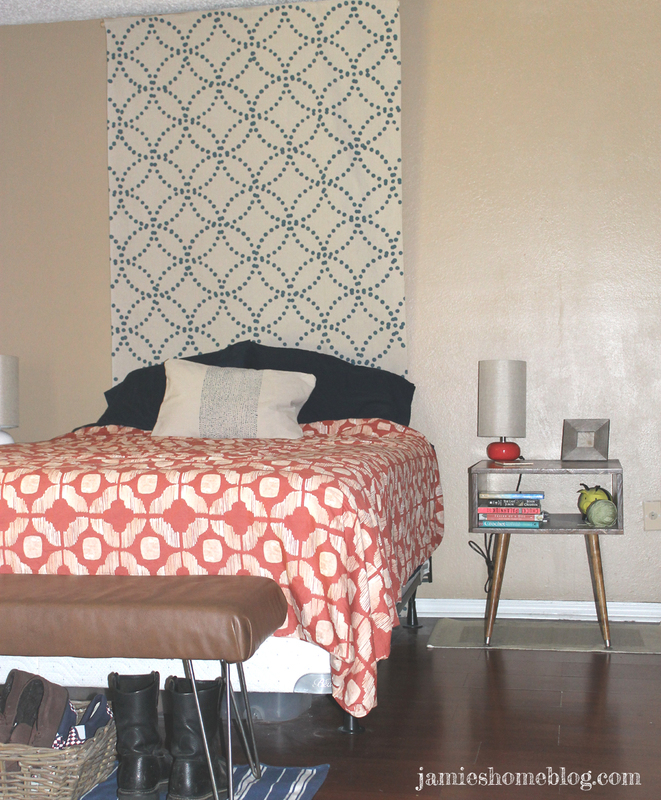 This entry was posted in Decor, DIY, Home Decor and tagged canvas headboard, diy headboard, diy textile headboard, painted headboard, wall textile. Bookmark the permalink. SO cute. I really like your style! Was this the drop cloth you sewed? I LOVE the endless circle. You’re fantastic. Thanks for posting this. Thank you Crisann! 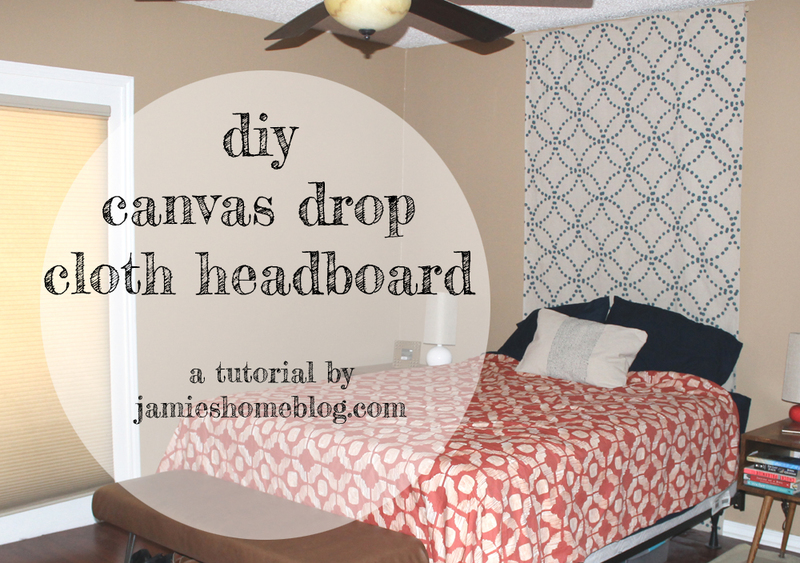 Yep it’s the canvas drop cloth sewn into a hangable textile! Isn’t that pattern great? I just love it!